We bought tickets online for the Vatican in order to avoid the long line-ups we have read about. Arriving at 10:00 we are able to enter right away, but so is everyone else. There are no lineups anywhere. The map provided by the museum isn’t the best but between it, a Rick Steve’s travel app, and Bob’s navigational skills we manage to find our way around. 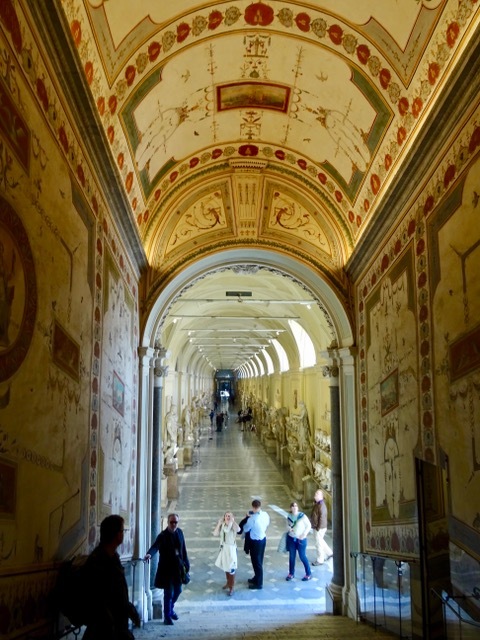 If you walk through all the galleries, it’s 7.5 km, or 4.5 miles long and yes we walked through all the galleries! 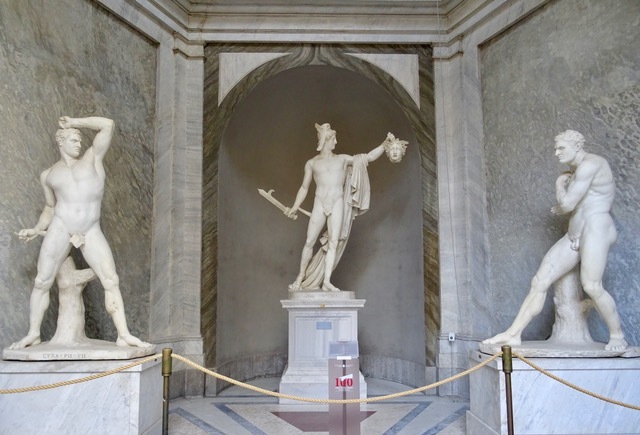 Be warned, this is a long post, so you might want to get a cup of something hot before you visit the Vatican Museums with us! 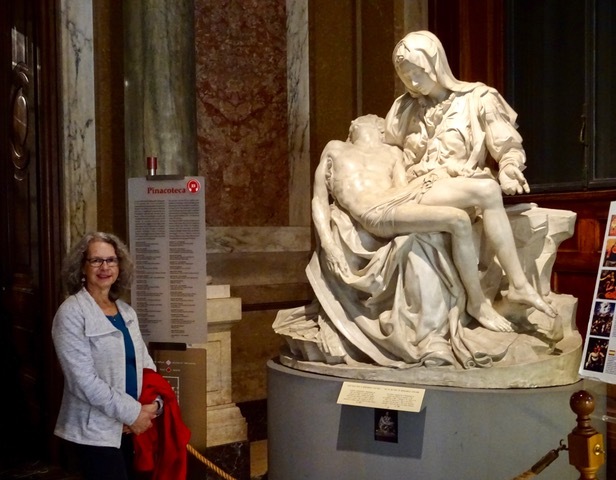 One of the first sculptures we see is this copy of Michelangelo’s Pieta. the original is now behind glass because it was badly damaged by a deranged man 45 years ago. I think this is the closest I will get to taking my photo with this incredibly beautiful statue. 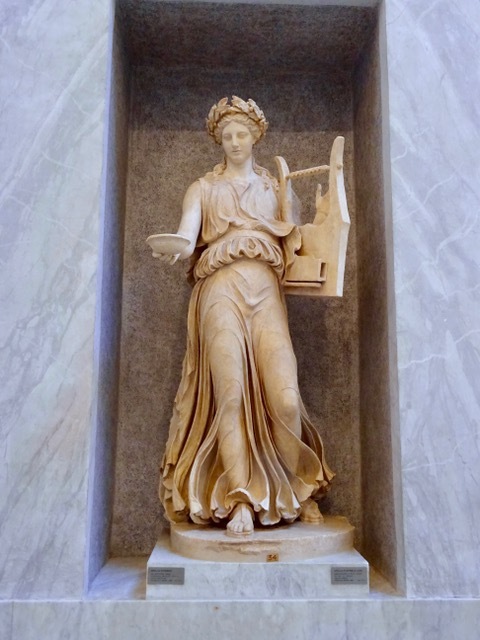 We see many examples of Early Christian and Medieval art. 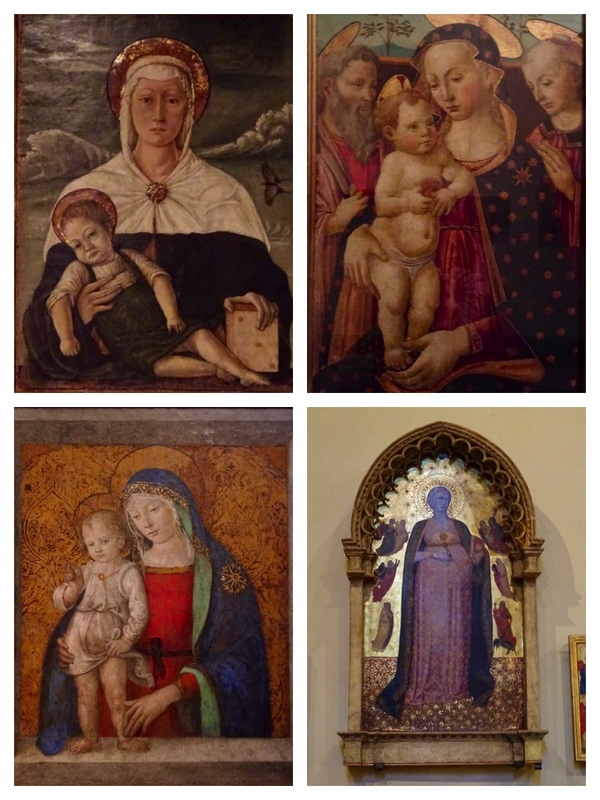 Before this trip I didn’t have a lot of interest in this genre but I discovered that I am rather fascinated by depictions of the Madonna. We even saw a pregnant Madonna, the only one I have ever seen. 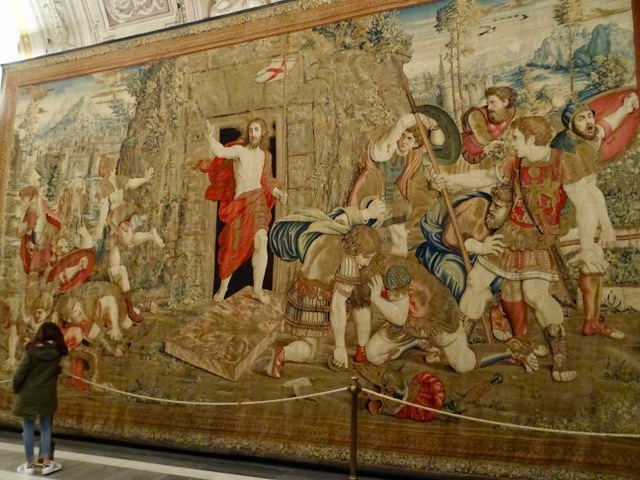 Next stop was a huge room with several very large tapestries. 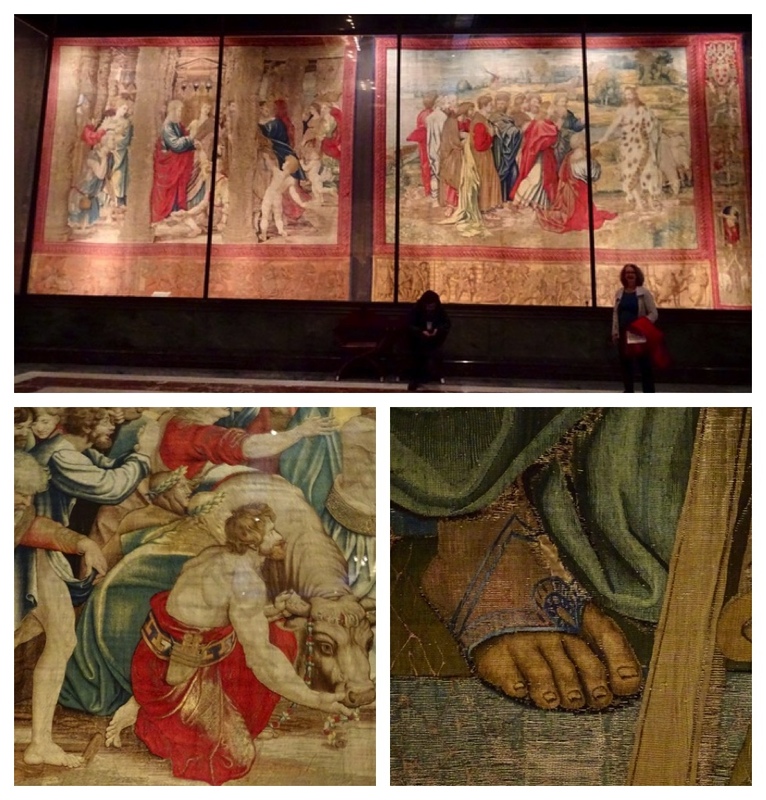 They were so finely woven that they almost looked like paintings. 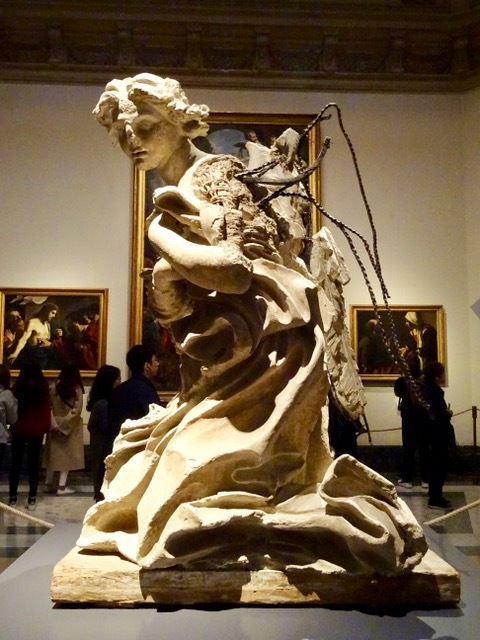 This very large angel from1666 was one of four preparatory straw and clay models for bronze castings by Bernini. 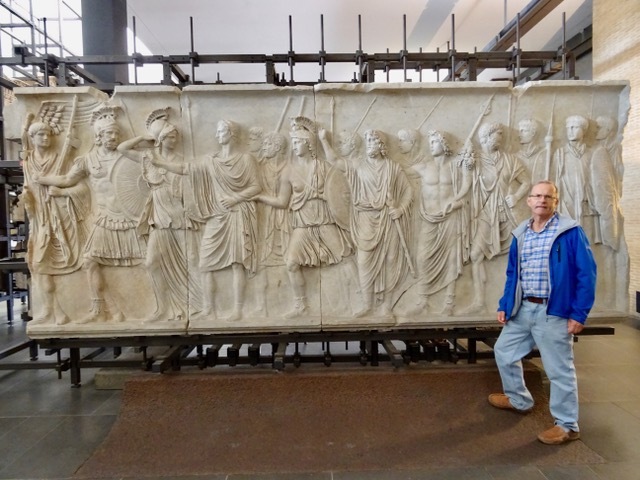 A enormous collection of ancient sculptures, sarcophaguses, reliefs and building parts was next. 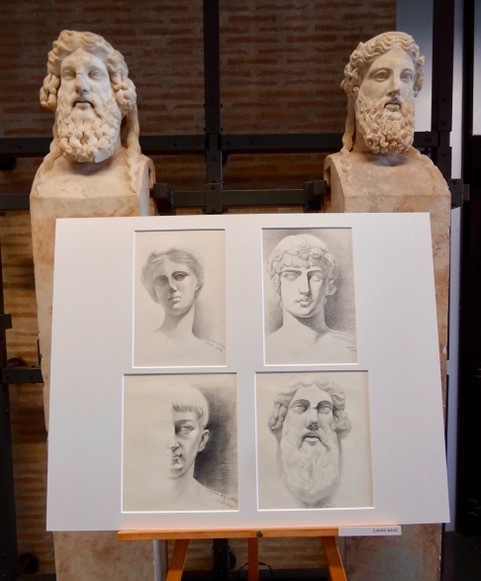 There was also a display of drawings, which I found interesting. I speculate that there must have been a drawing workshop. 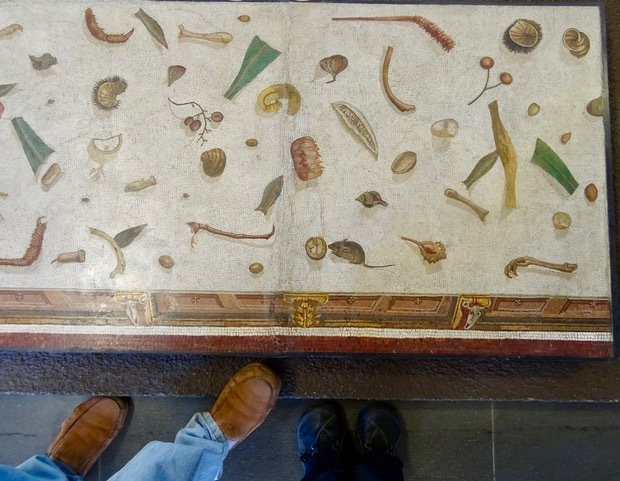 This is a floor mosaic that I remember seeing in books. I always liked the little mouse. The tiles are very small. I can almost feel the wind blowing these garments about. One of the reliefs on display. 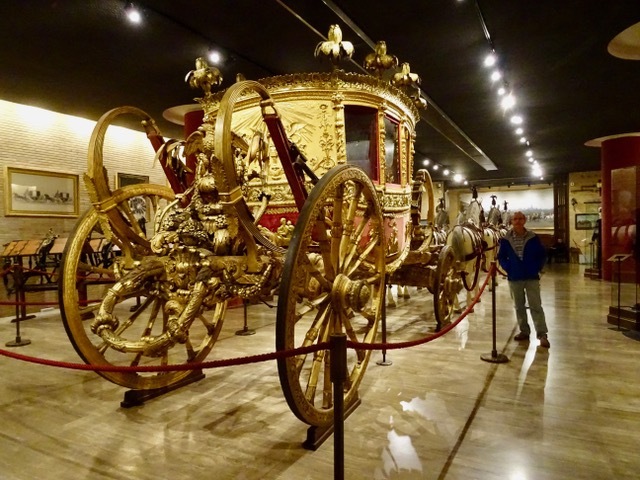 There is a large collection of vehicles used by Popes over the centuries. We didn’t know that all papal vehicles come equipped with a throne! 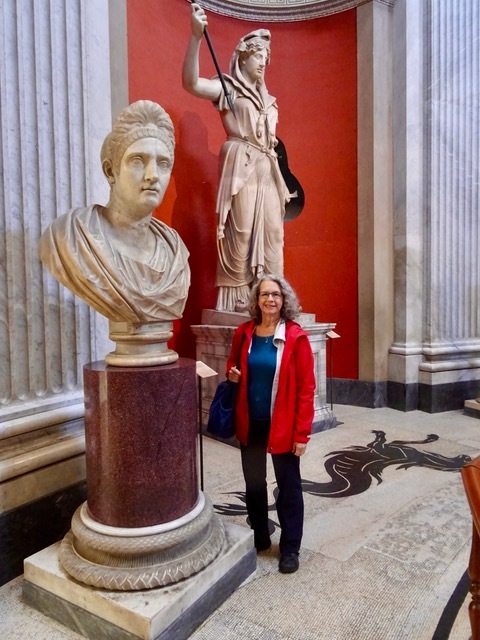 The Vatican has an extensive collection of Egyptian artifacts many of which are superior to the ones we saw in museums in Egypt! 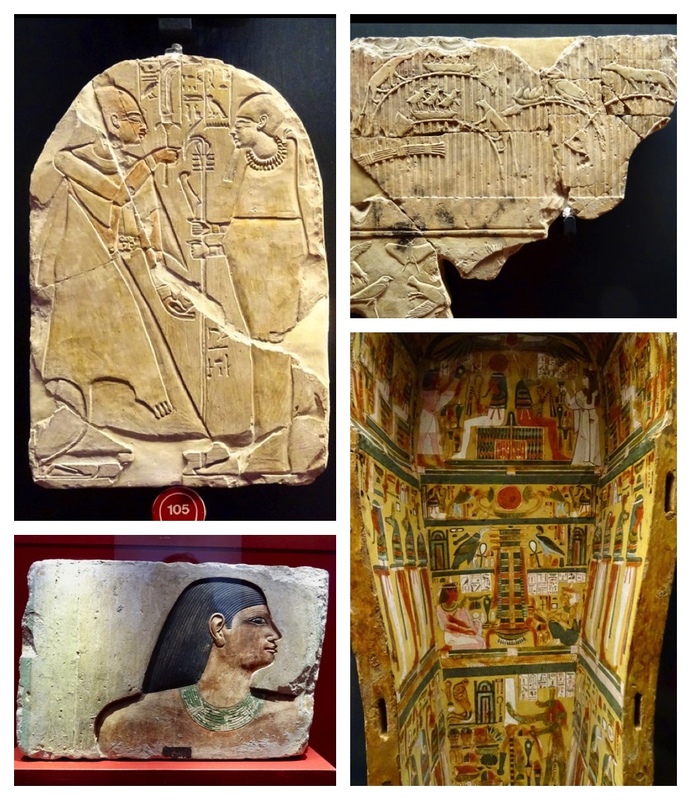 It is easy to forget that all these hieroglyphs were at one time bright painted like the inside of the coffin.The painted bas-relief fragment is from 2400 B.C. 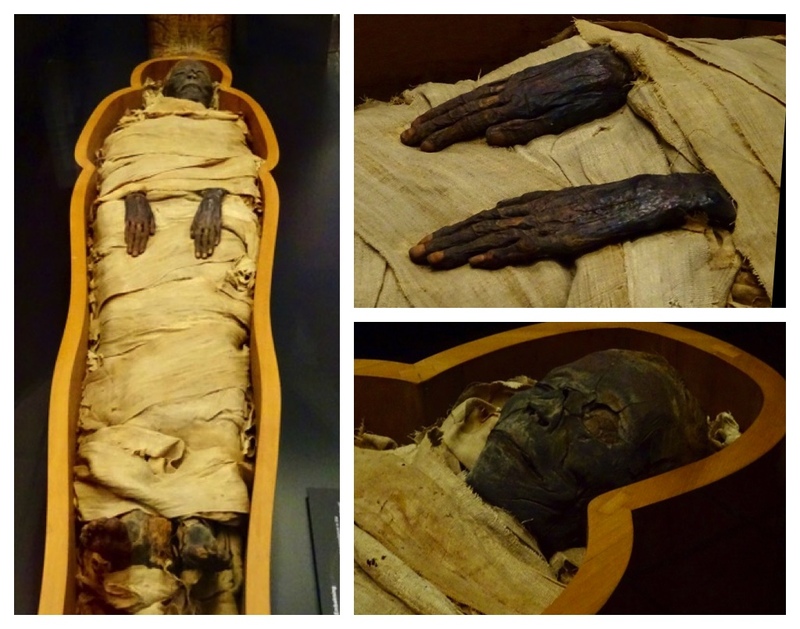 The Mummy of Taymen is from 750-525 B.C. We never saw anything like this in Egypt. It was fascinating, but I know this person never intended to be on display in a museum! 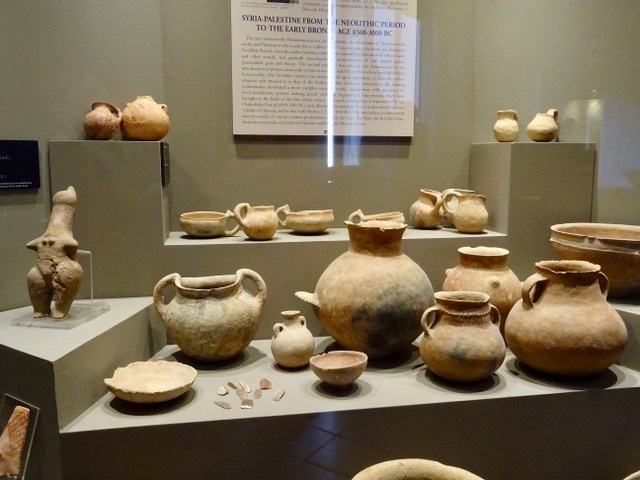 There are many galleries of Greek, Etruscan and Roman artifacts and these which are from Syria-Palestine during the Neolithic period 8500-3000 B.C. 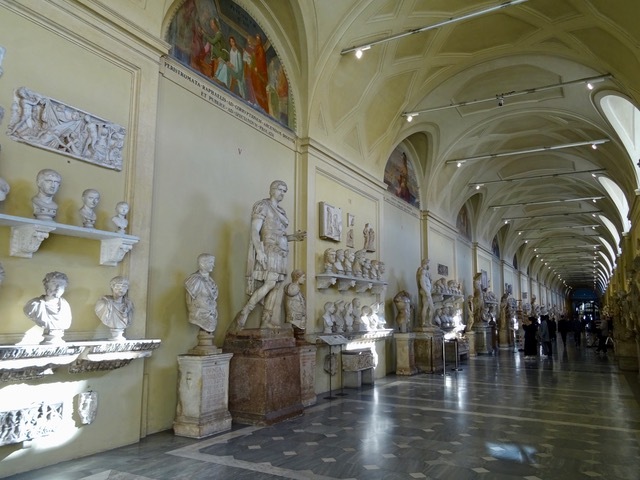 in a very long hallway lined with over a thousand sculptures! 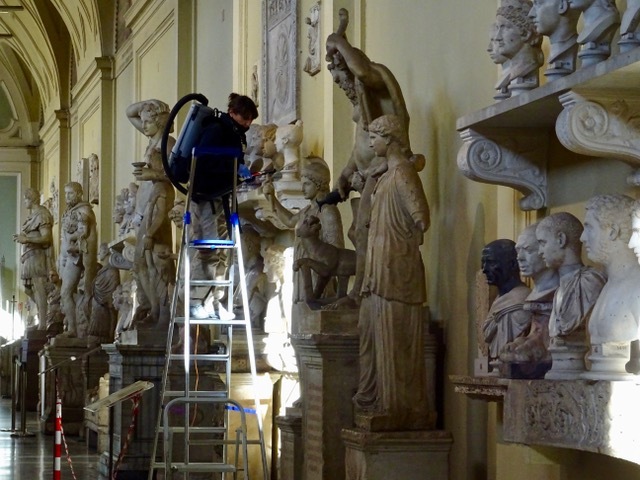 There were several museum workers busy dusting and cleaning. I imagine that by the time they finish it must be time to start again. 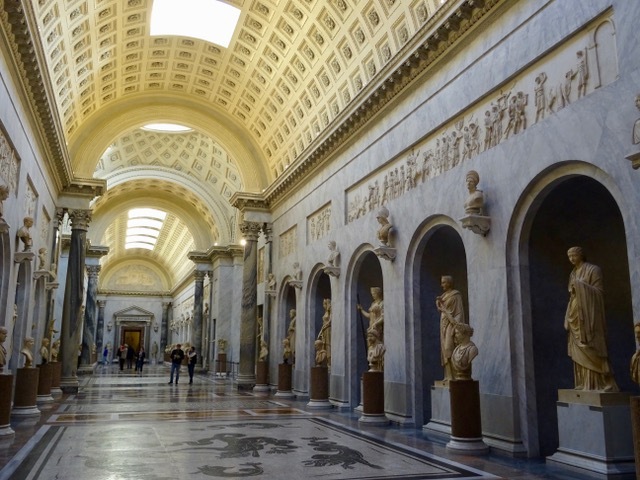 The gallery above opened into this one, lined with even more monumental statues. It simply takes my breath away. 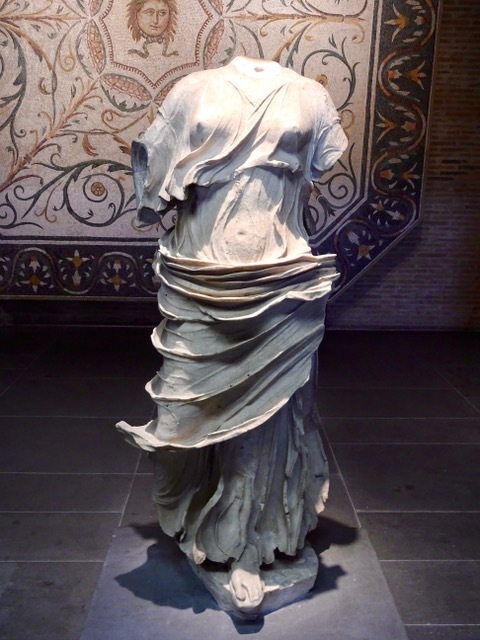 A Roman copy of a Greek original dating from the 2nd century A.D. The affection for the child is evident in the way he is held and regarded. I can’t imagine that something so life-like can be carved in stone. 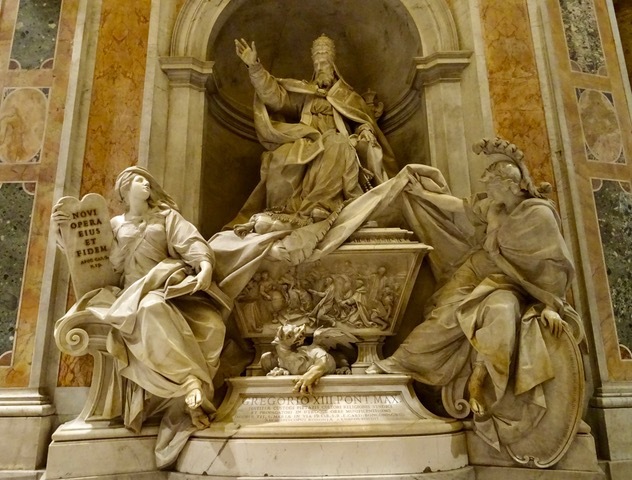 I am fascinated with the carved flowing robes. I have a hard time even drawing folds never mind chiseling them from stone. This is the Nile River God with another sculpture filled niche behind. There is an outside courtyard with a covered display area all around the exterior walls. There we see the biggest toe. 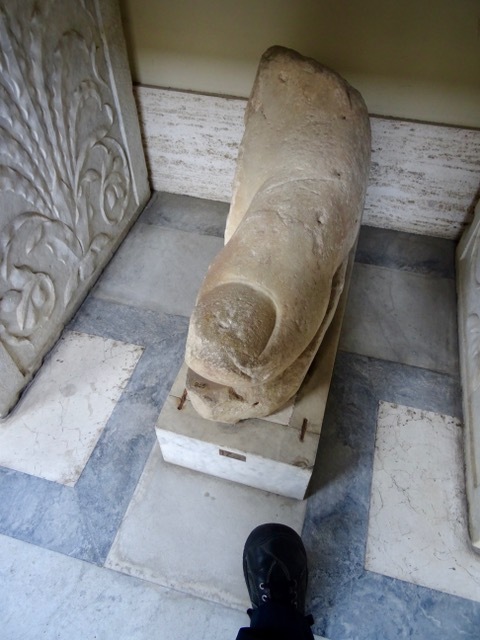 Can you imagine the size of the statue this once belonged to? That is my foot beside it. 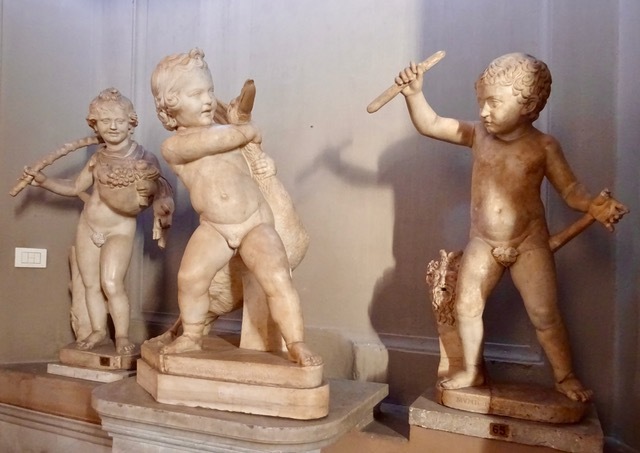 There are many incredible statues on display… but I am particularly drawn to these three. 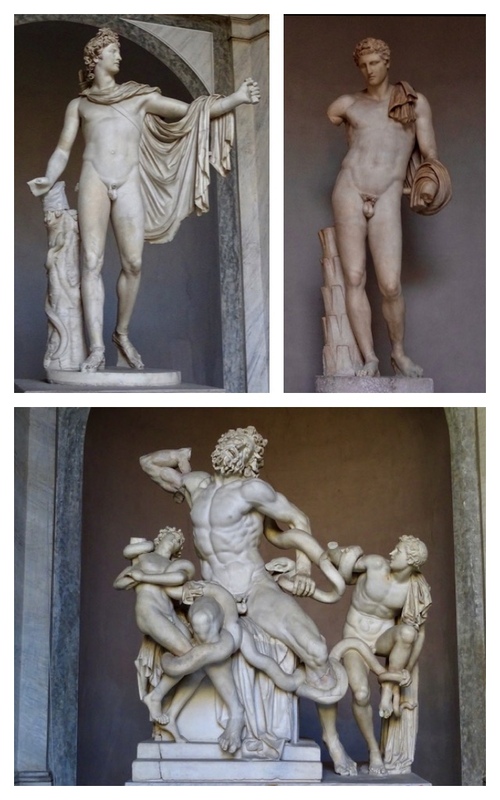 The Belvedere Apollo, the Belvedere Hermes, and the Laocoön. 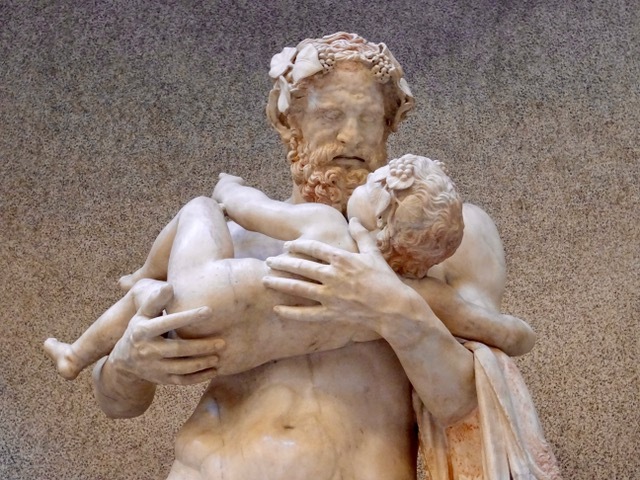 The Laocoön was unearthed during Michelangelo’s time and it had a great influence on his work. 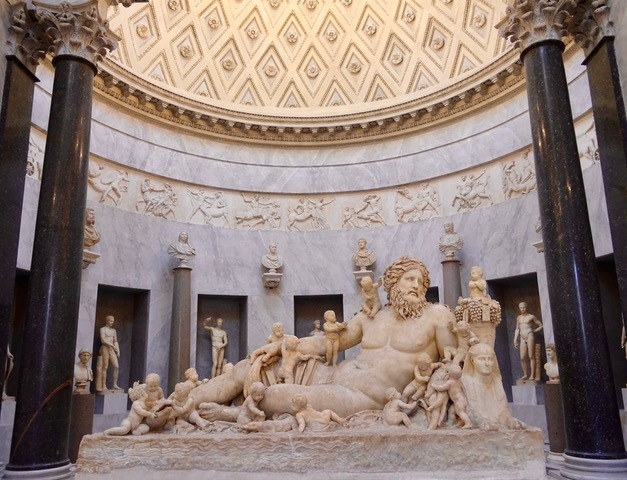 This sculpture of the River God Arno was the inspiration for Michelangelo’s David in the Sistine Chapel. 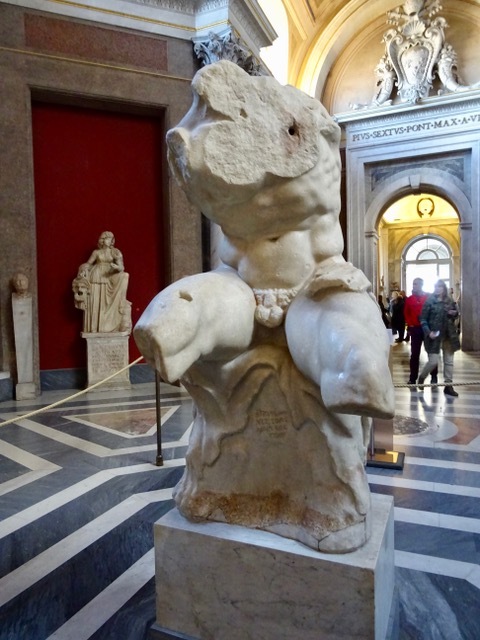 The Belvedere Torso was also the inspiration for Michelangelo’s God in the Last Judgement in the Sistine Chapel. We need to remember to look up. 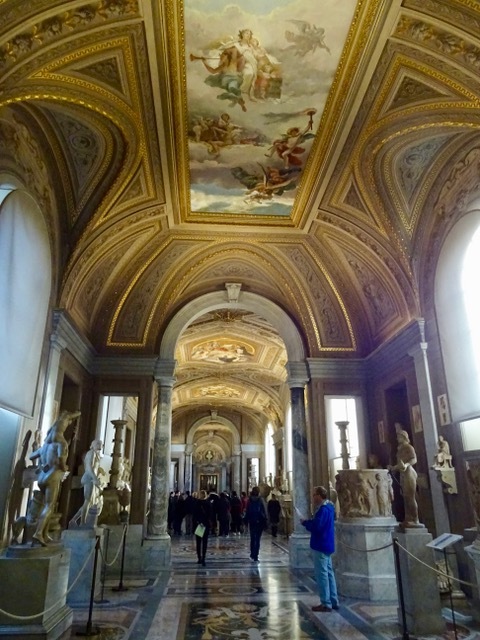 The ceilings in these galleries are as incredible as the art work below them. 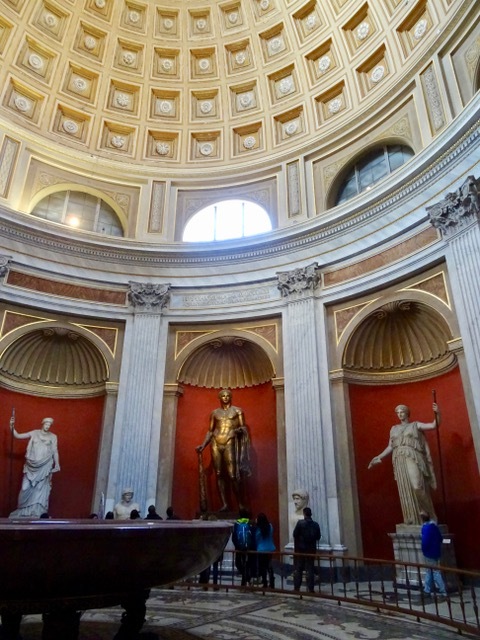 The Hall of Muses with its magnificent dome, mosaic floor, statues of the nine muses from the 2nd century A.D. and the largest carved stone basin in the world. These statues are monumental! Oh, and we are walking on the beautiful old mosaic floor here too. It looked like the statue was trying to give this rather bored looking guard something. 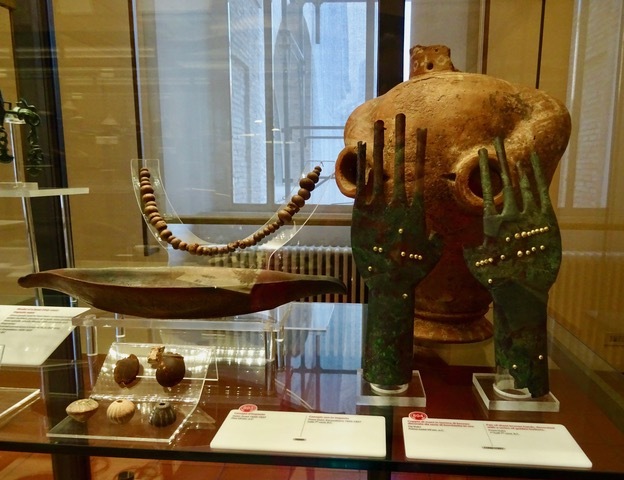 These bronze hands decorated with gold buttons are from the 1st half of the 7th century B.C. I thought they looked like a modern work of art. 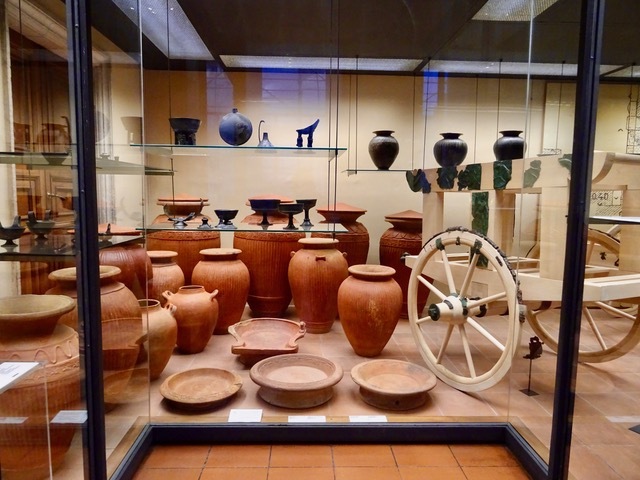 More display rooms with ornate ceilings… and lots more pots and other artifacts. In fact there were many rooms like this. We walked through all of them but I have admit that after a while we didn’t even try to look at all the items. 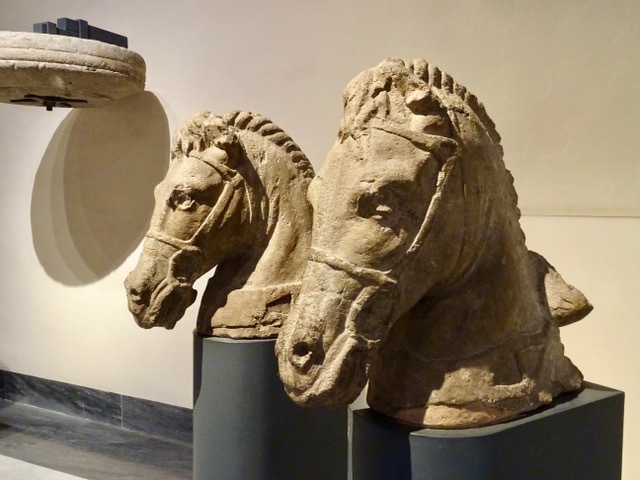 I did love these two horse heads… and there were some great views of Rome from the Gallery windows. Bob is trying to figure out where we go next. 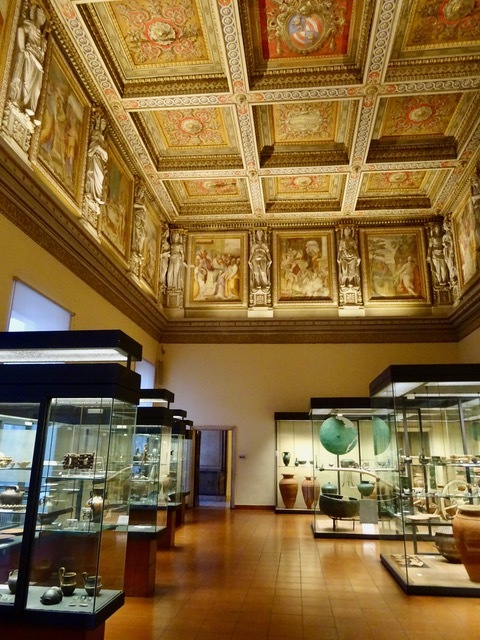 Turns out it is this room, with even more sculptures and carved stone artifacts, and yet another incredible ceiling. We both remember seeing a copy of this little boy with his goose in the Louvre many years ago. 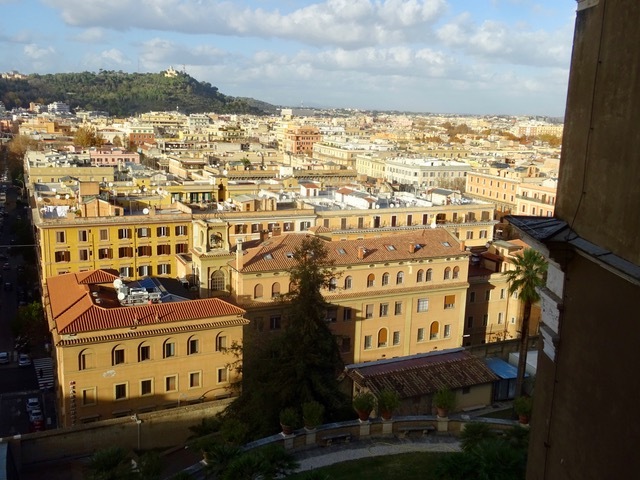 Interesting that we see it here in Rome too. 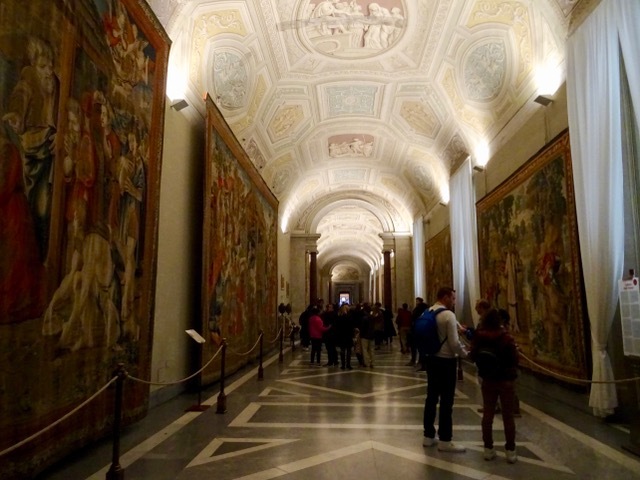 The Arazzi Gallery is a long hall with more tapestries on both sides. This tapestry has an optical illusion. As we walk by it appears as if Jesus’s eyes are following us and he even seems to move through the doorway. It is very strange. The Gallery of Maps is astounding. It seems to go on forever. 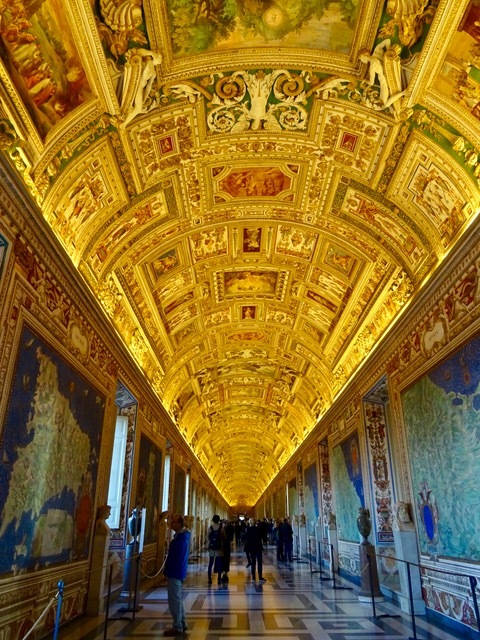 The walls are lined with huge maps of all of Italy but it is the ceiling that grabs our attention. 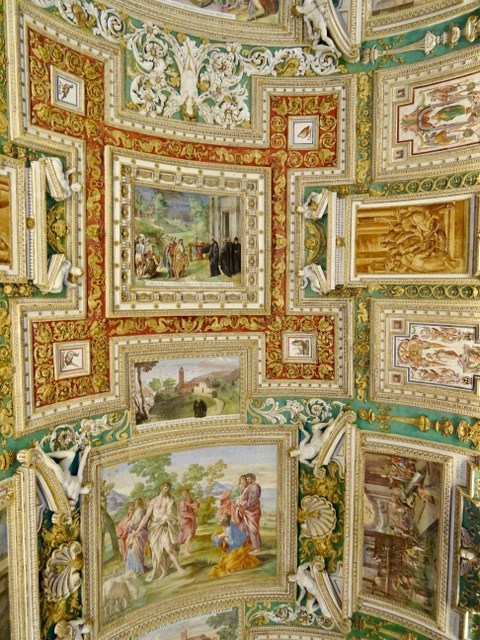 It is covered with paintings and sculptures and ornate frames. The lighting makes the ceiling look golden in the photo above but this photo shows its true colours. I just don’t know what to say. 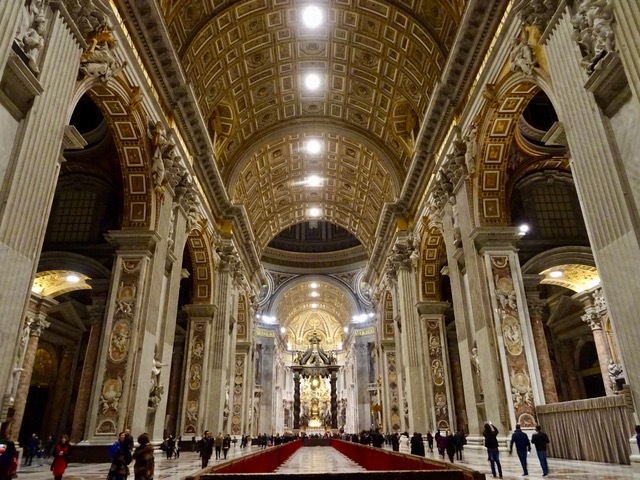 Words are simple inadequate to describe this very, very long ceiling. It is almost unbelievable. There are more galleries but we are getting very tired. We decided several hours ago that we need to come finish seeing everything another day. 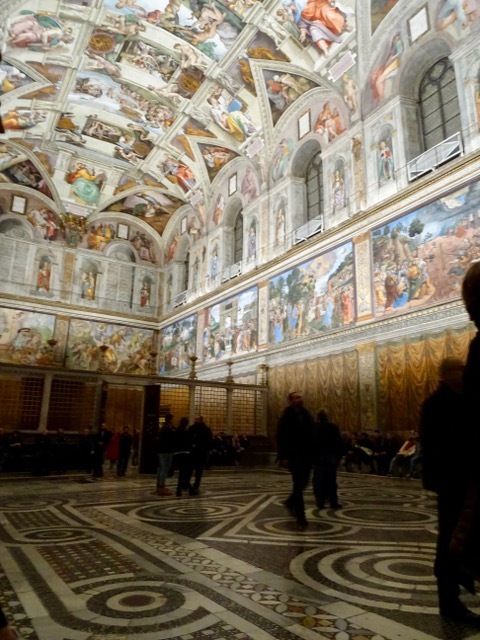 We make our way to the Sistine Chapel. We are so lucky, because it is late in the day there are not many people in the chapel. We find a seat along the wall and look up. There is so much to see. 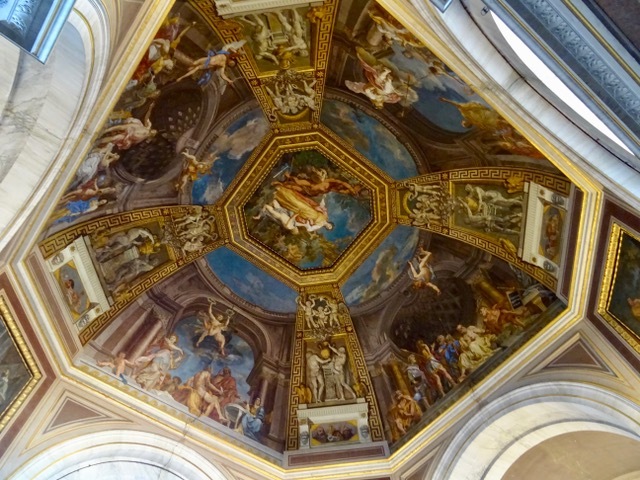 I think it is amazing that we are sitting here, in the Sistine Chapel looking at this masterpiece. 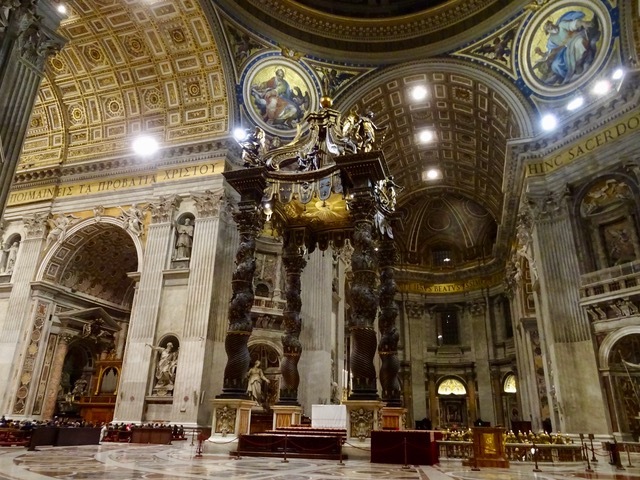 We probably spend almost an hour here but it is time to go as we still need to visit St .Peters and see the Pieta. 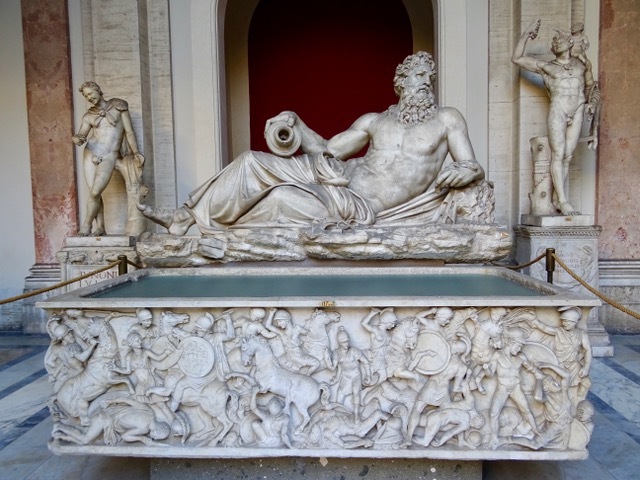 It is night when we leave the Vatican Museums. 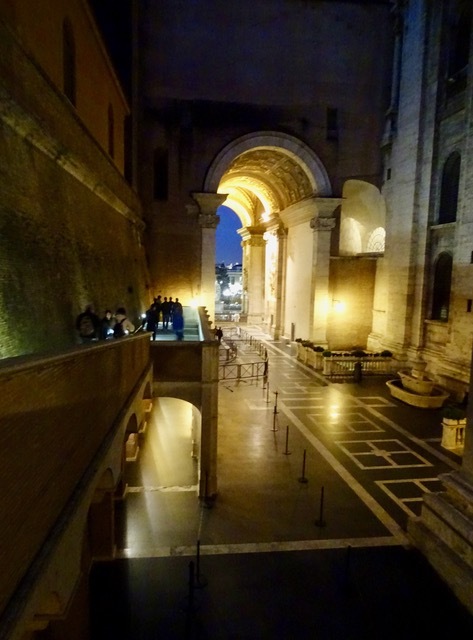 We go through the ‘secret passage’ that allows us to enter the basilica without having to line up and go through security again. There she is. 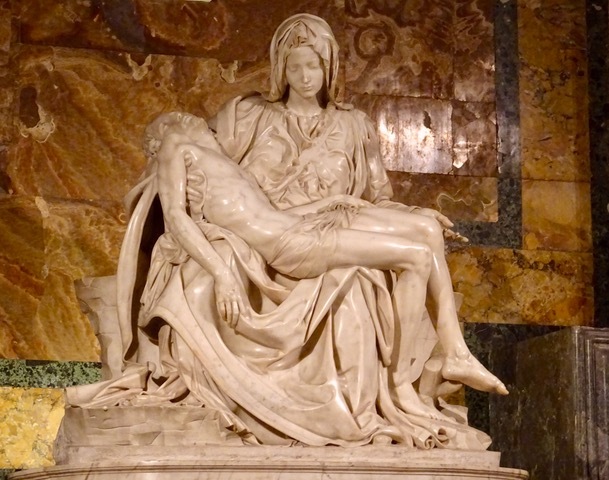 The Pieta, in all her glory. 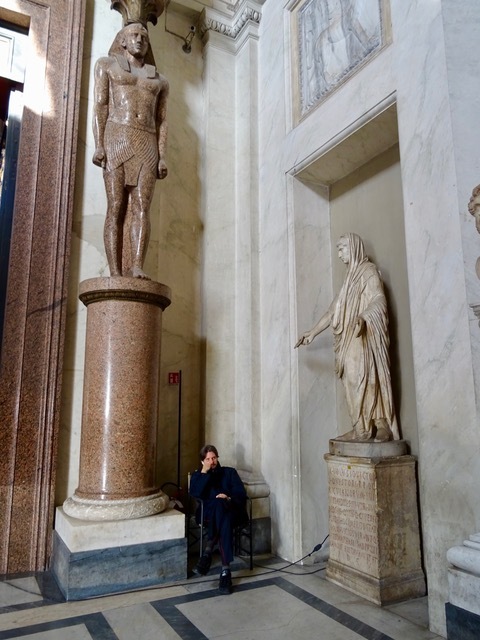 After spending some time with the Pieta, we walk around the basilica. We wanted to visit the grotto beneath the church but it is already closed. I like the little dragon between the bottom two figures in the sculpture. 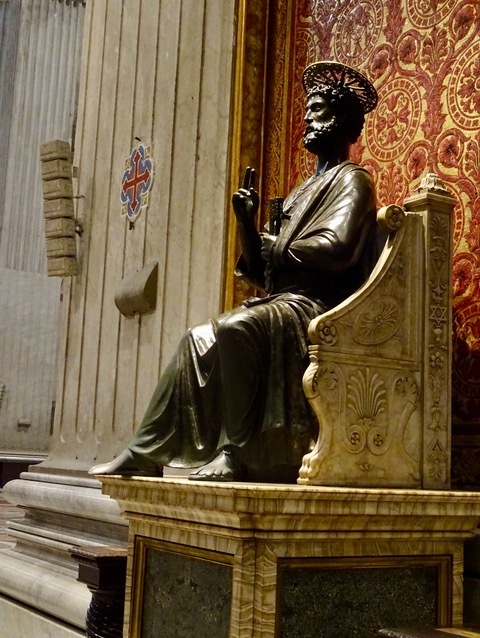 St. Peter’s right foot has been rubbed almost away by the touch of thousands of pilgrims over the centuries. There is a mass taking place so we listen to the organ music and singing for bit before we finally head home. It has been long day. 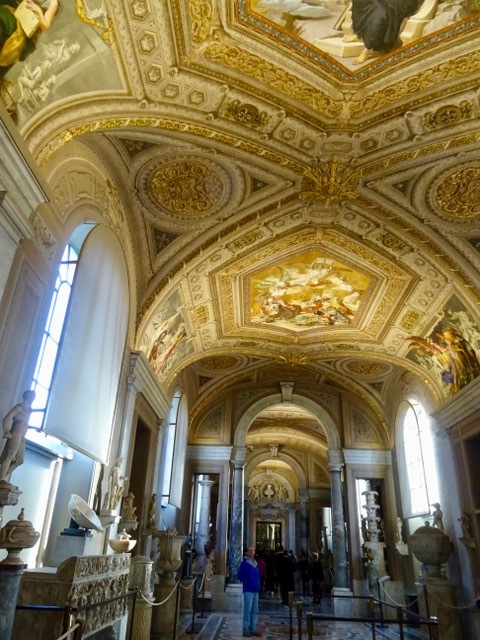 We spent 8 wonderful hours in the Vatican Museums but we are both very tired. . This entry was posted in Artists, Cathedrals, Churches, Historic Buildings, Italian Cathedrals, Italy, Mosaics, Museums, Portraits, Rome, Sculptures, The Vatican, Uncategorized, UNESCO World Heritage Site, Vacation and tagged Art, Cathedrals, Churches, Gallery of Maps, Italy, Michelangelo, Roman Sculptures, Rome, Sculptures, St. Peter, St.Peter'sBasilica, The Last Judgement, The Pieta, the Sistine Chapel, Vacation, Vatican, Vatican Museums by Trudy. Bookmark the permalink. Thanks Gayle, I always enjoy your comments. I mostly remember the Pieta and the tapestry where the eyes seem to follow you. I remember being quite freaked out! It was very strange! No idea why it does that but it certainly does.